This producer has been around for a while. Bonded in 1986, Basignani Winery weathered the lean years where the few existent Maryland wineries navigated individual county regulations. This was also two decades before Maryland wine (or Mid Atlantic wine in general) gained real notoriety. Despite the challenges, the Basignani family persevered and went on to become a winery of note. Today, with four active vineyards, Basignani is producing over 4000 cases annually. Their reputation for excellent wine commands a loyal following and a steady flow of visitors passes through the tasting room. I arrived on a raw early winter morning. A thin layer of snow was on the ground and patches of ice made the approach to the tasting room modestly more challenging. Nevertheless, a crowd had already begun to form. A fire was burning outside the tasting room giving the property a slight ski lodge vibe. Inside I claimed a spot at the tasting bar, where I was introduced to a number of the Basignani wines. Ten different wines were poured, which is more than I can cover in depth. White offerings included Seyval Blanc, Vidal Blanc and Chardonnay. Each example was well constructed and perfectly balanced. I will say that the Chardonnay was the real standout. Old French oak gave it moderately smoky notes without any hints of butter. The oak did not overpower the fruit allowing the ripe apple and pear to show through and make it an excellent food wine. Red offerings were the main event. The reserve Cabernet Sauvignon and a Nebbiolo, both from the excellent 2013 vintage, really got my attention. The Cab saw two years in oak and had enough time in the bottle to integrate the tannins into a complex wine. The Nebbiolo also featured complexity along with big fruit and beautiful structure. This winery was not previously on my radar, but I came away with a very favorable opinion. Basignani Winery is clustered with several other producers on both sides of the Maryland/Pennsylvania border, making it an attractive venue for a day of a day of exploring local wine. It is also easily accessible from Interstate 83 and a short drive from Baltimore, so no excuses. Stop in and please let me know what you think. I have recently been spreading the gospel of Maryland wine. I was converted at the Winter Wine Showcase in Baltimore back in January. So Maryland has entered into my routine discourse. In conversations over the last few months, the same name came up again and again. If people know only one Maryland winery, it is invariably Black Ankle Vineyards. Seriously! So when I made my recent pilgrimage to the Mount Airy region, Black Ankle was on my short list. 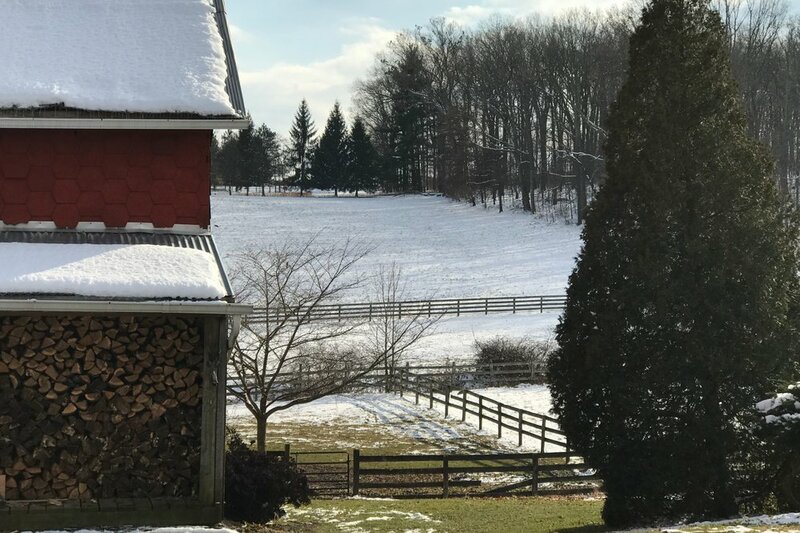 Ed Boyce and Sarah O’Herron left their careers as management consultants and purchased property in the Maryland Piedmont within sight of the Catoctin ridgeline. That same geologic feature stretches to the far side of the Potomac, where its rocky outcroppings contribute to the quality of many great Virginia wines. Ed and Sarah started planting in 2003 and by 2006 they were producing their first vintage. Today they have 46.5 acres under vine and there are plans to plant another 10 to 12 acres. Recent production reached 7000 cases and that was made exclusively from estate fruit. They are not sourcing any of their grapes. I am told that Sarah is the winemaker. I have no information on her training or background in making wine. Quite frankly, the only thing that matters is quality. Let me just start by saying that there is not a runt in the litter. The Black Ankle wines are uniformly excellent. Obviously some are better than others, but taken as a whole Sarah is making excellent wine, she is doing a few innovative things and her reds see extensive time in oak prior to bottling. Melissa, the tasting room manager, paired me up with Rick, who poured my wine. Rick has only been working in the tasting room for a year, but he has been a wine club member since the winery opened. So he knew the wines well and he did a great job stepping me through each of the offerings. His wine knowledge is extensive and I thought he was a great representative for the Maryland wine industry. He is definitely the kind of person you want presenting your wine to visitors. Kudos to Rick and two thumbs up for a great customer experience. I tasted several Black Ankle wines. I was excited to try their Grüner Veltliner. If you do not know this varietal, it is an Austrian grape characterized by bright acidity with citrus notes and occasionally hints of peach. It is a very fashionable grape that is gaining popularity. The Black Ankle example did not disappoint and contained all the typical characteristics. It is a lovely wine. There were a couple other whites on the menu, but I want to mention the Viognier. Despite its status as the “official” Virginia grape, it is typically a little flabby and most that are produced in the MidAtlantic are not really great wines. Sarah added 25% Grüner and completely changed its profile. The acidity added that missing dimension. Brilliant! Oh, but let me tell you about the reds. They are growing Syrah, Pinot Noir and all of the primary Bordeaux varietals. The blends, particularly the Bordeaux blends, are the main event. They have a range of price point to quality, but they are all uniformly excellent. As I was stepped through the lineup, I was amazed by a wine only to discover that the next was even better. But then Rick poured the 2013 Crumbling Rock, which is the premium blend. Sweet baby Jesus! It is big and complex with a finish that just went on and on and on. I see double gold in the future of that wine. It is not an exaggeration to describe it as world class. On the day of my visit, there was rain in the forecast. This may have kept a few people away, but there was still a healthy crowd in the tasting room. The throng is dispersed to indoor and outdoor tasting bars. For those intent on lingering (and you will want to linger), there is ample seating inside or out on the patio. There is music on Fridays and most days they serve picnic fare, which includes local cheeses. Or, if you prefer, it is perfectly acceptable to bring a picnic and enjoy it inside or out with a bottle of Black Ankle wine. I will stop short of saying that Black Ankle is the best winery in Maryland, but only because I have not been to every winery in the state. Of the seventy(ish) wineries, however, it has to be in the top five. It can easily compete with any MidAtlantic winery I have visited (and I have visited a lot of them). What I am telling you is you can find truly great wine a few miles from Mount Airy. Now, Black Ankle has a large wine wine club and a very loyal following, so 85% of their wine is sold direct to consumer. I guess I’m suggesting that if you want to taste the wine, you will want to stop by the tasting room. You really do need to visit and when you do, please send me your notes. I do want to know what you think. According to most sources, the oldest continually operating commercial producer of fine wine in the state of Maryland is Boordy Vineyards. But what does that mean? Well, in 1980 the Deford family purchased the vineyard from Philip and Jocelyn Wagner . Most people are probably unaware that Philip Wagner, who planted the his first commercial vineyard in 1965, was one of the most important early advocates of American wine production and consumption. Wagner is still cited for his belief that, much as it is in Europe, wine should be accessible to the larger public as a normal daily beverage. This is the legacy that the Deford’s purchased along with the property that operates as Boordy Vineyards. It is a real and important piece of American wine history. Today Boordy is not only the oldest, but also the largest producer of fine wine in the state. With 20 acres under vine at Long Green and another 25 acres nearer the Blue Ridge Mountains, the winery bottles about 26, 000 cases annually. Overseeing that production is winemaker Tom Burns, who has been with the winery since 1986. In an age of rapid expansion in eastern wine production, quality winemakers often change employers with regularity. This is not universally the case and Burns’ more than 30 years with Boordy is a case in point. That is not an indication that the winery is satisfied with the status quo. Burns, along with vineyard manager Ron Wates, have undertaken an ambitious program to improve the quality of the grapes and ultimately the wine. Boordy Vineyards is fully engaged in the quality revolution that is sweeping eastern wine. The Landmark Project is the most recent effort to produce a competitive line of world-class wines. It is one of three distinct lines of wine and the one that is destined for recognition among the best wines in the Mid Atlantic. It was this particular line that I sampled during my recent visit. There were four whites on the menu. All were balanced and well crafted. The Sauvignon Blanc and Albariño were stellar. These are also grapes that one encounters with increasing frequency and seem to have a promising future on the east coast. The Albariño was my top pick with its orange blossom and apricot notes that give the impression that the wine will be sweet and fruity. On the palate, however, it bone dry with crisp acidity. The red offerings included three blends of Bordeaux varietals and Syrah. There was also a pair of Cabernet Francs. The Landmark Reserve is the flagship blend, so it should come as no surprise that it was my overall favorite. It is a big blend filled with cocoa and licorice notes. You can just get lost in the nose and the finish goes on forever. I will be remiss, if I do not give props to the Reserve Cab Franc as well. As a single varietal it can deliver clues about vineyard management, because blending does not mask potential faults. I have to say that the Boordy example can stand up against any I have tasted. The big, beautiful nose gave way to coffee and dark fruit on the palate. I finished my notes with the word “Brilliant!” and a series of stars. It is certainly a world-class example of that varietal. Of course, the venue is nearly as interesting as the wine. The rolling hills of Maryland’s Piedmont give a sense that one is really in wine country. The winery buildings have an almost colonial historic feel that blends in with the rest of the region. Inside the tasting room the amenities are modern, well apportioned and comfortable. Finally, for a larger winery they have not forgotten the importance of customer service. The staff was well trained, attentive and knowledgeable about the product. So I can give high marks is every category. Boordy Vineyards ranks among the best wineries in the region and is a must-visit for anyone exploring Maryland wine. Located northeast of Baltimore in the Maryland Piedmont, Dejon Vineyard opened their doors in 2007. The two acres of estate-grown fruit is planted exclusively in Chambourcin. Other grapes are sourced primarily from Maryland and the Fingerlakes. The winery does import Malbec from Chile. Dejon is a small, boutique operation that can attract large numbers of visitors to their tasting room. When I stopped in there was a healthy crowd at the tasting bar and what appeared to be a private party using several tables in the center of the tasting room. There were nine wines on the tasting menu. The dry-style Chambourcin was not available. I was able to taste the sweet Chambourcin. At 3% residual sugar, it is used primarily to make sangria, which is the wineries most popular offering. Maryland’s Piedmont Region does not get nearly the attention it deserves. People are generally shocked to learn that the area north and northeast of Baltimore contains some of the best wineries on the east coast. Elk Run Vineyards just north of Mount Airy is one of those wineries of note. In the 1960s, Fred Wilson worked for Constantine Frank in the Finger Lakes. Frank, who died in 1985, is credited with demonstrating the international grape varieties could grow in the Eastern United States. Frank also happens to be the most celebrated and historically significant New York winemaker. The fact that Wilson learned his craft from an industry legend is obvious when sampling the Elk Run wines. There were 7 Maryland and 10 Virginia wineries in 1980 when Fred and Carol Wilson began planting grapes in the Maryland Piedmont. By 1995, Elk Run had nearly 25 acres under vine. Today those grapes are used to produce 3500 cases of fine wine annually. Elk Run occupies a hilltop where the old-growth vines have good drainage and sun exposure. (There is a second and larger vineyard further west, so I cannot speak with authority, but I am told that it is an even better site for viticulture.) The tasting room is fairly humble, but cozy with separate spaces for large groups or events. There was a nice crowd assembled around the tasting bar and many of these were enthusiastic repeat customers. The tasting sheet listed 18 different wines that were divided into four categories: dry white, dry red, slightly sweet and dessert. I will point out that “slightly sweet” does not mean sweet. At about 1.5% residual sugar, the sweetness was barely perceptible. That little bit of sugar simply brought out the fruit notes in the wine, which gave the impression of sweetness. Even the dessert wines were not cloying, but tended to be well balanced. I prudently did not sample all of the offerings, but selected a few of particular interest and tried a couple others that were recommended by the Wilsons. I started with a sparkling Blanc de Blanc made in the traditional method (method Champenoise), which I’m convinced can compete with any sparkler on the East Coast. The remaining whites included Pinot Gris, Sauvignon Blanc and a pair of Chardonnays. I really liked the Sauv Blanc, but the Liberty Tavern Chardonnay was off the charts. It was perfectly balanced, earthy and silky smooth with honey and tropical notes. Among the reds there was one blend. The single-varietal wines included Pinot Noir, Malbec, Syrah, two different Cabernet Francs and a Cabernet Sauvignon. All were very well crafted and I particularly liked the Cab Sauv, but the Cold Friday Cab Franc was my overall favorite. Geez! Dark fruit, structured tannins and a long finish are just a few of the descriptors. It is no mystery that it won gold in the Maryland Governor’s Cup. It is an excellent example of what is regionally possible for Cab Franc. Great wine! It is quite common to visit a winery and find only one or two wines that are genuinely exceptional. That was not the case at Elk Run Vineyards. Everything I tasted was worthy of praise. Recommending this winery is something of a “no brainer.” In addition to world-class wine, it is a beautiful venue that also represents a bit of winemaking history. Stop in and let me know what you think. I just love stumbling across something unexpected. I saw Fiore Winery on the Maryland wine map, but they were totally off my radar. I had heard absolutely nothing about them. 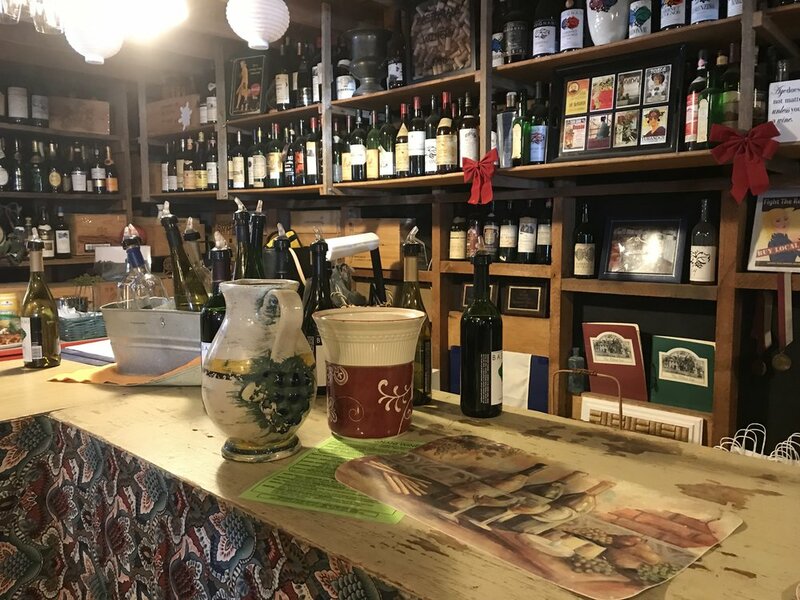 While exploring the Maryland Piedmont, I stopped in their tasting room and now I can’t stop talking about my experience, the wine and the grappa. Yes, they are also a craft distillery. The area around Fiore is rural. The immediate region is largely farmland dotted with small towns. The winery itself seems to sit right at the edge of the rolling hills that comprise the Piedmont. The vines occupy a slope that provides good sun exposure and drainage. The location also provides a commanding view of the plain that spreads out below the vineyards and tasting room. Although Mike and Rose Fiore met in Boston, they are both originally from Calabria, Italy. In 1977, after living in both Boston and Baltimore, the couple settled on their farm where they raised a small menagerie and a large garden. Mike grew up in a family of winemakers, so viticulture might seem like a natural next step. It was actually a family tragedy, however, that led to winemaking. Following the death of their youngest son, Mike began planting grapes. Despite beginning as a contemplative effort, the distraction soon grew into a business. Since planting his first 50 vines in 1982, the Fiore vineyard has grown to ten acres. The winery officially opened in 1986 and today produces around 10,000 cases annually. In 2007, a rather high-end craft distillery was added. The Fiore’s distilling operation produces whisky, rye, vodka, limoncello and grappa. I am always reluctant to corrupt my palate by sampling liquor during a day of winetasting, but I am a sucker for grappa. If you are unfamiliar with grappa, it is a type of brandy that is distilled from grape pomace (the skin, seeds and pulp that remain after pressing the grapes). They produce two varieties. The premium version sees a little time in oak, which gives it a slightly darker hue. The Fiore grappa reminded me of my first experience with the liquor in Europe. Waxing nostalgic, I purchased a bottle of their higher-end grappa, which is of such quality that I am reluctant to share. There were a dozen wines on the tasting menu and another collection that I will mention separately. I conducted a selective tasting, but I can report that everything I sampled was very well crafted. Among the whites, I am most compelled to comment on the Traminette. I find that many Traminettes from the Maryland Piedmont often lack the heavy floral notes, which can be a little off putting. The Fiore example had just a bit of residual sugar, which brought out notes of honey and pear in a wine that was perfectly balanced. This quality was typical of the other white offerings. The reds included a Super Tuscan that was my hands-down favorite of the tasting. The wine sees extended aging in oak. The one I sampled was a 2007, which might have slightly skewed my perception, since that was possibly the best year in the history of Mid-Atlantic wine. Nevertheless, it had a beautiful nose that contained hints of cigar box and dark fruit. That fruit was also present on the palate, but with an earthiness, tons of complexity and beautifully structured tannins. I could give tasting notes ad nauseam, but the wines were all worthy of note. Having said that, I will give brief mention to the Ripken Family Collection. The Ripkens, of course, are of legendary baseball fame. Their family property is very nearby and they asked the Fiores to produce a boxed set. The number on each of the three bottles corresponds to the number on each of the Ripken jerseys. I might go on at greater length, but I think you get the picture. This is a winery that should be on everyone’s radar. It is less than an hour from Baltimore and roughly the same distance from Philadelphia. I live at least three hours away and I will definitely go back for the wine and the grappa. After you visit, please send me your thoughts. 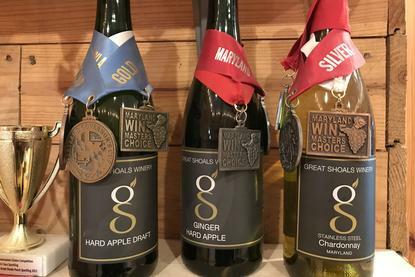 Carroll County is home to some of Maryland’s best wineries. In 1995, when Galloping Goose started growing grapes, those other producers did not exist. The newer wineries get a little more attention these days, which seems a little unfair. On the other hand, it may be largely by design. When owner Diane Hale started planting the 30 acres of vines that cover the hillsides of her Northern Maryland property, the plan was to sell the grapes. That is still part of the business and Galloping Goose fruit is sold throughout the Mid Atlantic. Along the way, however, Diane started making wine. Today it is an established family business that she runs with the assistance of her sons John Michael and Jason. The desire to sell wine and attract visitors is tempered by a fear of attracting throngs of weekend revelers in search of entertainment. This is decidedly not the type of clientele Galloping Goose is keen to attract. Instead, they have fashioned a family-friendly atmosphere meant to target local customers looking for a place to unwind with their children. Many features of the rural property create a safe environment that is ideal for children. Activities might include sledding on a snow day or nature walks in better weather. The property is filled with attractions that might interest young children. This can include fishing in the pond or searching for the secret dragon’s nest. Of course, parents are encouraged to taste the wine and the hope is to establish a cadre of loyal patrons, who will frequent the property and tasting room. The ridgeline is ideal for grapes with good drainage, schist-loam soil and nice airflow. The cool nights are also idea for grapes. All of these vineyard attributes result in excellent fruit, which is reflected in the wine. After tasted through several of the Galloping Goose wines, I will attest that they are uniformly well crafted. The whites display balance and the reds contain the necessary complexity. Some of the standouts included a Chardonnay that is a field blend of five different clones and a Chinon-style Cabernet Franc/Petit Verdot blend. My overall favorite was the Barbera, with its bright acidity and a hint of frizzante sparkle. I don’t want to leave you with the impression that Galloping Goose is only for families. At the same time, do not expect live music and a boisterous crowd. The atmosphere is subdued, but it is a lovely spot to relax with a glass of wine and enjoy the serene nature of the venue. 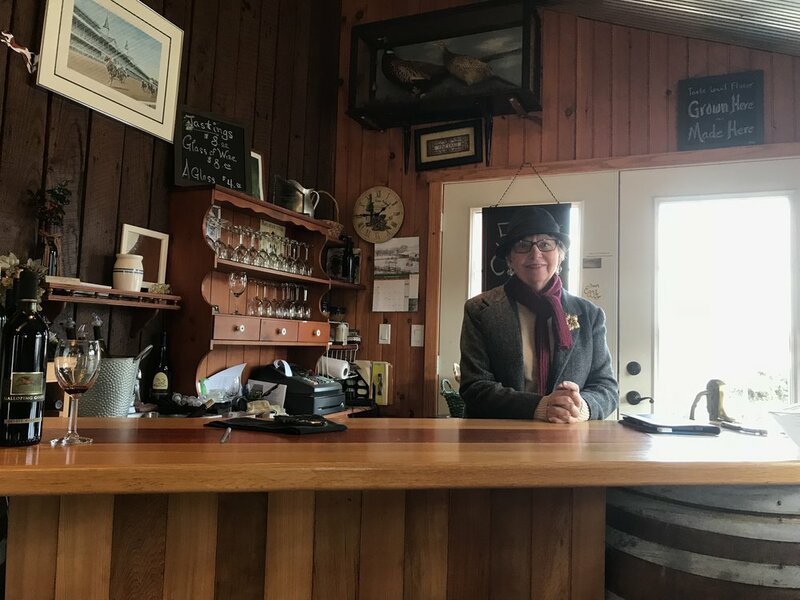 Whether you live nearby or happen to be passing through, if you are in northern Carroll County, I strongly recommend stopping in at Galloping Goose Vineyards. After you do, please let me know what you think. Wine quality has almost every thing to do with quality fruit. Winemaking is first and foremost an agricultural pursuit. At Harford Vineyard and Winery just north of Baltimore, they have embraced this basic truth. When owners Kevin and Teresa Mooney started planting grapes in 2003, the plan was to operate as growers for other Maryland wineries. With few in-state resources they consulted with Penn State and Tony Wolff in Virginia. Kevin also took classes in Virginia at Linden Vineyards with Jim Law. Today the Mooneys have four acres of high-density vine. They are growing Merlot, Vidal Blanc and Traminette. Kevin handed maintenance of the vineyard over to his son Brent, so that he was able to concentrate on then next phase of his project. Kevin supplemented his estate fruit with other grapes from Harford County and opened Harford Vineyard and Winery. Initially the Mooneys poured wine in the winery where there was little room and no seating. In 2015, a formal tasting room was opened that provided ample space for visitors and events. At the time of my visit, Kevin was in the tasting room and stepped me through about 10 of his wines. I will say that each of the wines demonstrated very high quality that is a result of excellent fruit. The effort in the vineyard is paying high dividends at the tasting bar. The wines produced from estate fruit were total standouts. The Traminette, Vidal Blanc and Merlot all displayed ripe fruit. The whites in particular were balanced and showed nice acidity. Wines made from source fruit were also excellent. There was a very nice Cabernet Sauvignon that spent 18 months in Hungarian oak. The Cabernet Franc was a highlight of the tasting. Again, it was made from ripe fruit so there were not green notes. It had a beautiful nose of dark fruit and on the palate it was complex with a very nice finish. It is uncommon in the Mid Atlantic to visit a tasting room and find all of the wines to be worthy of note, but frankly that is what I found at Harford. The estate fruit is of exceptional quality and it seems that the grapes that were locally sources were of a similar caliber. Harford Vineyard may be only one stop on the Piedmont and Mason Dixon Wine Trails, but they are an important part of that experience. I have to say that this stop was a complete surprise. Harford was not previously on my radar. They definitely got my attention and I will do my best to spread the word. This is a winery that deserves our patronage. I cannot recommend Harford strongly enough and I am very curious to hear feedback from other visitors. In January of this year, I had my first exposure to Maryland wine at the Winter Wine Showcase in Baltimore. Since that event, I have been a huge fan of Maryland wine and I have been looking for opportunities to explore the state. From my home in Charlottesville, Virginia it is about a three hour drive to some of the nearer tasting rooms. Despite the distance, I fenced off a weekend and made the trip up to the wineries around Mount Airy. Linganore Winecellars was one of the seventeen wineries pouring in Baltimore. So I targeted them for my first stop. I arrived at Linganore around 10:30 on a Saturday morning and spent a little time walking around the property. The vineyards are situated on the rolling hills surrounding the small valley that contains the tasting room complex. 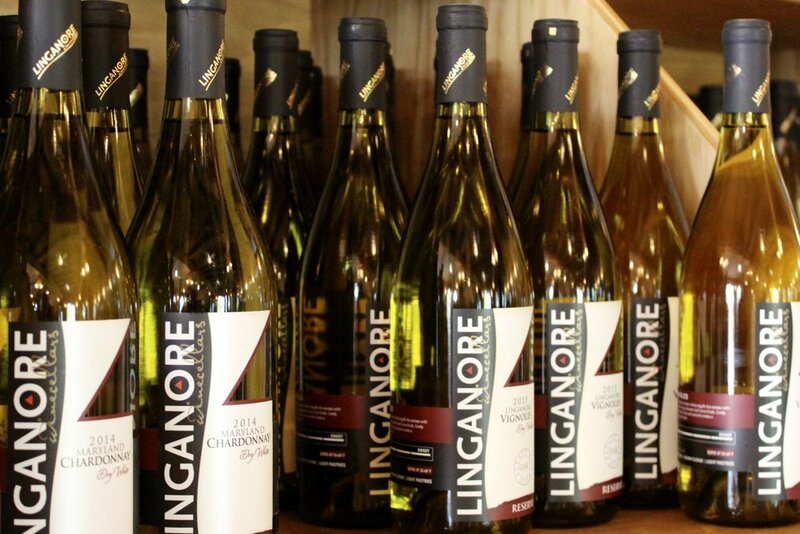 Linganore's 75 acres of grapes is the largest vineyard in the state. It is land that was once used for dairy farming and the barn, built in 1857, has been renovated for use as a winery and tasting room. It was still morning and there was a threat of rain, so the crowds were fairly subdued, but the property is set up to accommodate a sizable number of visitors. East of the tasting room, there are picnic tables and shade trees for use during better weather. Just outside the front door, there is another space with tables and umbrellas. Inside the tasting room, the integrity of the 19th-century barn has been preserved, while also giving the central space a fairly modern look. At the rear of the space there are a pair of long tasting bars and the center of the room is filled with racks of wine. Everything is made of wood and it blends seamlessly with the ceiling and support beams of the barn. Had my server not told me, I would never have guessed that he had only been pouring wine at Linganore for a couple of months. Dan was very knowledgable and the perfect customer-facing representative for the winery. The entire tasting blended into a long conversation about the winery, surrounding area, wine in general and a wide variety of other topics. It is the kind of experience I always hope for in a tasting room. There are several tasting options available. Linganore makes a number of sweet and fruit wines, but I opted for a dry flight that included a dozen different wines. Among the whites, the Chardonnay took gold in the Governor’s Cup and their Vidal/Vignoles blend won double gold in the Finger Lakes. It was a the single-varietal Vignoles, however, that really got my attention. If you are unfamiliar with this grape, it is a French hybrid of uncertain parentage that is often done in a sweet style. At Linganore it is done in a dry style. It is a lovely, nicely balanced aromatic wine filled with crisp citrus notes. Among the reds I think the Linganore superpower is Chambourcin. This is a varietal I seldom point to, because it can be extremely acidic with a mid-pallate astringency that I find off-putting. The Linganore Chambourcins had none of that. The best example was big and aromatic, with nice fruit, pepper and cedar notes which wrapped up with a long finish. This is undoubtedly a result of ripe fruit and good vineyard management. My final analysis is good wine in a great venue and if you can make it to the Mount Airy region, I suggest a visit. I think the entire state of Maryland is worth exploring and Linganore Winecellars should be on your list. After you stop in, I am very interested in knowing your thoughts. Mar 3-Oct 14 Sat-Sun 11 to 6; All other times by appt. I visited this winery more than a year ago and just realized that I failed to write a profile… Whoops! Links Bridge Vineyards sits on a hilltop above the Monocacy River on 38 acres that were originally planted in corn and soybeans. Joan and Robert Thompson purchased the land to use as a “weekend” winemaking project. Since commercial winemaking is nearly never a part-time endeavor, I am curious to see how things are shaking out. In any case, when I stopped in, Links Bridge was still a relative newcomer to the Maryland Piedmont, but they did have a respectable wine program and had already worked the kinks out of their customer service. The tasting was well conducted and guests have an option of a self-guided or curated walk through the wines. The Thompsons grew grapes for 13 years before opening their own operation. They sold the fruit to Old Westminster and also gained experience by working for that producer. This gives the “weekend” image of Links Bridge a bit more meaning. Indeed, the wines I tasted were all very well crafted. There were more whites than reds on the tasting menu, but that is to be expected of a new winery. In the end, location is a large part of the equation for success. 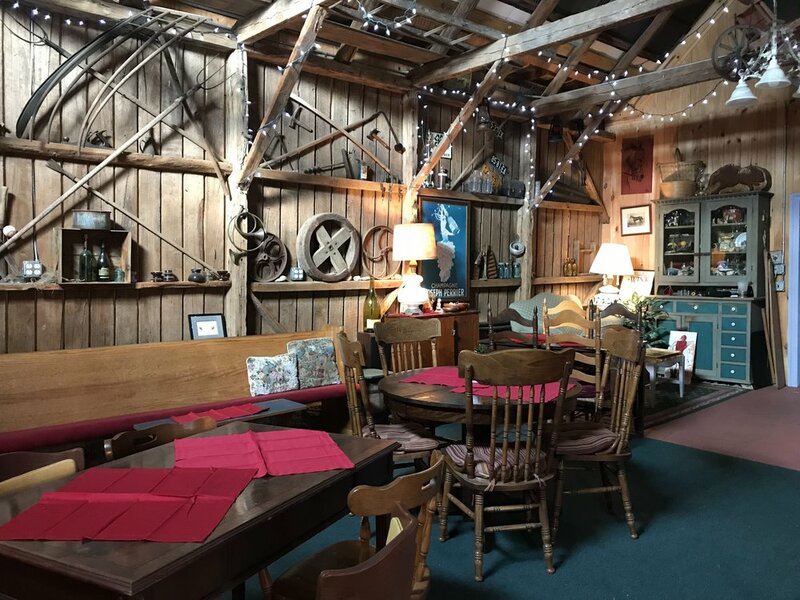 Located just off Route 15 between Frederick and Hershey, this is a tasting room that can be accessed with relative ease. So combined with their service and the quality of the wine, I predict great things for Links Bridge Vineyards. I recommend stopping in and, after you do, please let me know what you think. There is a history of winemaking in the Loew family. In the pre-World-War Austo-Hungarian Empire, the Loews produced and exported honey wines. After emigrating from Europe and pursuing a career as an engineer, Bill and Lois Loew decided to plant vines and make wine in Maryland’s Piedmont Region near the town of Mount Airy. Planting began in 1982 and the couple sold their first bottle of wine in 1986. Today, with five acres under vine, Loew Vineyards produces about 2000 gallons of wine annually and they think of themselves as “garagistas” (a reference to artisan winemakers producing less than 1000 cases annually). They also happen to be the fourth oldest of the existing Maryland wineries. The Loews began as hobby winemakers before transitioning to a commercial winery. Unlike most of the nearby wineries, Loew produces wine primarily from hybrids, honey and fruit. Cabernet Franc was the sole vinifera I noted on the tasting sheet. Grape names like Marechal Foch, Leon Millot, Reliance and Seyval Blanc jumped out at me as I perused the list. Most I had tasted before, but there were a couple new grapes and I always love trying something new. The tasting menu was divided into categories based on color and level of sweetness. We started out with an excellent dry-style Seyval Blanc that was balanced with bright acidity. This was followed by a series of dry reds that included a Marechal Foch and a couple of blends. While I enjoyed all of the wines, the Leon Millot/Seyval blend was my favorite of the tasting. It was a dark, complex wine with a beautiful finish. When I stopped in late in the day, there was a large crowd that was just starting to thin out as the tasting room approached closing time. The tasting room was small and welcoming with ample tables to accommodate guests. Despite spending a long afternoon tending to waves of visitors, the staff was upbeat, professional and customer oriented. Before you go thumbing your nose or engaging in other forms of snobbery at the thought of strange hybrid grapes, stop in and give the Loew Vineyards wines a try. Everything about the experience is first rate and well-made wine can be excellent despite the use of hybrids. Put this winery on your list and after you visit, let me know what you think.